THE JEWISH QUESTION has been debated ever since England’s “Jew Bill of 1753,” which dealt with the ability of Jews to integrate within Western Europe. Since that time, Karl Marx, Theodore Herzl, and even John Paul Sartre, have written on the “Jewish Question,” expanding the question into political, religious, and even, “poetic” realms. But on a grass roots level, both past and present, the “Jewish Question” as discussed in taverns, coffee houses, and restaraunts, is about the perception of Jews existing as a peripheral and disloyal group that is internally cohesive and conspiratory. I would like to tell you what I mean by the term, “Jewification.” Since the Jews have no culture or ideology of their own, being a people of the Diaspora, and most of them being “secular Jews,” the term “jewification” has to do rather with the “agenda” of the Jews. And an agenda they have indeed! To “jewify” a nation’s culture, (for a nation’s culture does not exist in a vacuum but always has an ideology attached to and informing it), is to have imposed on that culture a Jewish way of looking at things. And it’s all so lighthearted and so enriching is it not! And then we turn on Seinfield at night and the skinny Jew boy makes us laugh and feel so good about being allowed entry into the jewish way of looking at things. Have you seen the cover of this week’s Newsweek? The hideous looking Jewish face of Alan Greenspan who is laughing all the way to his and his Rothschild friends’ privately owned Federal Reserve Bank which is charging interest on loans of printed money to us Americans up the gazoo, is leering at us from this red fluorescent cover of the Jewish-owned Newsweek. 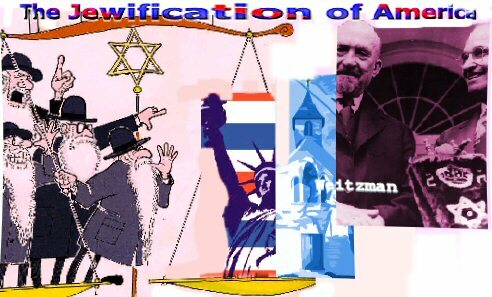 The jewification of America began almost as soon as the Jews got off the boat in America in the late 1800s. Yes, the Jews came over because good ‘ol Christian America opened its arms to the persecuted and “innocent” Jews fleeing the pogroms of Russia! “Oh we are so persecuted everywhere we go!” say the Jews. In Henry Ford’s, The International Jew, written in the 1920’s, he outlines the beginnings of the Anti Christian Jews’ attempts to jewify America by first eradicating Christianity from public life. You see, before the Jews could impose their way of looking at things and how we should act thereby, they first had to get the Christian way of looking at things out of the way. Next came the Jews’ role in bringing America into World War I. Why did Woodrow Wilson, whose friend was the Zionist and his own Supreme Court appointment, Louis Brandeis, suddenly come out in favour of the War in 1916? It was because the Zionist Jews supported by the Rothschilds, sent Chaim Weizman to the Great Britian to strike a deal with Prime Minister Lloyd George. The deal, as recounted by the former Zionist Benjamin Friedman turned Roman Catholic, was the following: Germany had won the war by 1914. Then Germany invited France and Britain to the peace table and said, “Okay, we’ve won, but there will be no losers. Let’s just go back to how things were before. So what happens next, the Rothschilds send their pawn, Chaim Weitzman, to Llyoyd George and the British parliament with these words, “You don’t have to lose the war. We will bring America into the War through our contacts with Woodrow Wilson. But you’ve got to promise to give us Palestine.” (They did not mention anything about their designs on the oil fields of the Ottomon Empire or did they?). Anyways, from that conversation, the Balfour Declaration of 1917 appeared. Now here’s what happened in America. Woodrow Wilson had a lot of Jews advising him. Wilson was enamored of the Jews, especially when they “helped him out” now and again. More “help” was on its way. The Jews got wind that Woodrow had an illicit affair with a fellow Professor’s wife while teaching at Yale. After Woodrow gulps and the color of his face changes to a deep reddish hue, the Jew chimes in, “We have arranged to loan you the $40,000 as a contribution to your election campaign.” And no sooner does the Jew make that promise or rather, “blackmail” poor Woodrow, that all of a sudden, good ‘ol Woodrow wants America to enter the War! Time does not permit me to go into the Jews’ role in bringing America into World War II. That will be for another article. But what we are seeing *now* as a consequence of the Jewish efforts to eradicate the “Christian way of looking at things,” is the “Jewish way of looking at things” in full force! How so? First of all, the Jewish way of looking at things, begins with their own unspoken approach to life, which is, their obsession with self-preservation. The Jew is a materialist with no aspirations for a life after death. All of their hopes and dreams are invested in the here-and-now. This, coupled with a half conscious guilt for their crimes and misdemeneors against the offended Goyim, give rise to their obsession for self-preservation. The Jews want nothing more than a weakened, impotent culture to exist in. This works to their benefit so that they can take over a society of jaded, passive, and unprincipaled citizens. Will homosexuality and lesbianism weaken that culture? You better believe it, since the family unit, (which the Jew lives and dies for), is the central component of a strong nation and healthy culture. That’s why you have Jews promoting deviant sexual activity in their synagogues by their token Gay rabbis; in their Newsweeks; in their TV shows; in their New York Times; and in their Hollywood. Will multi-culturism weaken a nation’s culture? You better believe it. For multi-culturism served up, “Jewish Style,” means, multi-religionism. “Diversity Is Our Strength!” reads the slogan penned by the Jewish Madison Avenue boys. But this slogan flys in the face of the saying of one of their own who exhorted, “United we stand, divided we fall.” We all know that a unified idea confers strength, but a plethora of ideas only creates confusion and impotence. Thus we have seen the Jews favouring, promoting, pushing, writing, “lobbying” for all of the Open Immigration bills, beginning with the Immigration Law of 1965 which opened the flood gates of all kinds of multi-cultural peoples with their multi-religious views. Need I go on and on? We all know that America’s foreign policy is based on the Zionist Dream that every Jew should have a place to escape to — I mean, to live in perfect Jewish freedom. But there ain’t too many of dem Jews here in America who want to live that Zionist Dream – but rather to have our tax money in the billions every single year, sent over there for carnage, mutilation of childrens faces by fierce hot flaming US made bombs, in order that their great grandchildren, may have a place to flee to if necessary. One begins to wonder if the Jews will have to wait that long for the flight of their darling little Jewish princesses and little boys to Zion. I have already seen on the street the flinging arms of the “offended Goy” raised in frustration. I think it is only a matter of time before those “flinging arms of the offended Goy,” turns into a defiant fist. Organized = Orderly, In Order, Organization, Corporation, Tightly Knit Network. Their aim and purpose in life. Crime = Not lawful, lawbreaker, commit sin, Not Right and Just, but wrong, evil against the law, immune from the law, above the law. Well Organized Crime or may I say the Mafia was invented by the Jews. Jews: Meyer Lansky, Bugsy Siegel, Lucky Luciano all Jewish not Italian. Whenever you watch or hear about The Sopranos, (Even though they say ‘Italian’), look at their mannerisms. If you study the Mafia’s Mannerisms, it looks way more Jewish than Italian. Wow! Thanks for clarifying so much for me! Is there a way for Blacks (like Obama’s Reverend Wright who is in trouble for anti-Zionism comments) and Whites (like the stormfront.net types who also oppose Zionism) to unite against Zionism? I wish there was a way to have some kind of Christian United Races Against Zionism movement. Just as multiculturalism is fragmenting, nay, destroying, Americanism, many patriotic White Pride type people waste time directing anger against Blacks. Why can’t they promote preserving the White, Black, and Asian races by peacefully objecting to mixed marriages (what Zionist PCers now call “Blended Families”) and unite against Zionism? Is it Zionists who are brainwashing us into thinking it is okay to have Black Pride, Hispanic Pride, Jewish Pride, and even Gay Pride, but wrong to have and express White Pride? Why is it okay for all races execept Whites to want to preserve their race by not race-mixing? My son, who is in high school, said a friend of his has “Latin Pride” boldly written on his binder. My son said he would be absolutely afraid to write “White Pride” on his binder, knowing he would be called a racist. 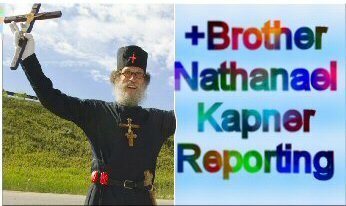 My son and I are German-English Scotts-Irish American Oneness Pentecostal converts to Greek Orthodoxy. Our Cypriot Priest says the Ethiopian Orhtodox Church has the Ark of the Covenant! I am in awe of my Black Orthodox brethren, but I still believe in preserving my race, as I’m sure they do. I’ve long thought that the widespread practice of circumcision in the US and the so-called “Echelon” (US, England, Australia, Canada, and New Zealand) countries since the early 20th century was an obvious way to leave the mark of Jewification on the flock of Goyim. In addition to helping Jews blend into the general population so they (the males) cannot be identified physically, it is literally a physical brand that goes together with the overall Judaisation of the culture, education, and thinking of those parts of the world. It also normalises sick genital infatuation, child abuse, and assertion of authority over an unconsenting innocent souls. Sir, there are no ‘good’ Jews. Which makes it clear that Christ was addressing the Jews. You’re quite wrong about Chaim Weitzman - he was already in England at the time, working in the chemical industry. The main reason that Balfour supported Weitzman’s agenda was that Weitzman had invented a method for producing artillery propellants that did not rely on imports, allowing the British to keep in the war without the need for external supplies of explosives. The Balfour declaration was the single worst decision by a British minister of the 20th century - it has led to the parasitic Zionist state screwing up the whole of the Middle East and our oil supplies, and it was all sealed because Weitzmann had the secret recipe for explosives. Hello I have a question Bro. Nathan, though I don’t know where to post it but I hope you will see this and will have time to answer me. First of all, I love your site. I was now enlightened regarding the 2 types of Jews (as I have called it) Zionists and Orthodox Jews. I was so amazed to have known about Christianity emerging in Russia and that Mr. Putin is an Orthodox Christian, but I have read a website (about interpreting Bible prophecy) and it says that Russia is having an ally with the Muslim nations surrounding Israel. I won’t go any further, but I know that you know about Gog and Magog. Is there any chance that Russia represents Gog? Gog & Magog: This is figurative language for enemies of the Church, the Israel of God, as St Paul describes the Church in Galatians 6. It CANNOT be proven that present day Russia, or the ancient northern Russ, is Gog and Magog. Russ converted to Orthodox Christianity in the 11th Century and has been revived by Putin and Medvedev’s wife, Svetlana. I am a fellow parishioner of them all. During the last half century, Jewish doctors have promoted circumcision as “healthy” for Americans. This savage mutilation was a necessity for desert tribes who lacked water to properly wash themselves. Jews incorporated this primitive practice into their religion. Since it is their identifier, Jewish physicians have been encouraging Americans to have their children circumcised so that Jews will not be singled out. I don’t think that Wilson ever taught at Yale. Will you please change it. By the way I have just read E. Michael Jones’s the Jewish Revolutionary Spirit. I recommend it to you. Read it and see if you can recommend it to you readers? This is something I have thought every time I am confronted with this conundrum! Recently I have been amazed at how almost every film out of the US is overbrimming with Jewish actors and influenced with Jewishness where once they stayed quite covert they are now very much in your face. I just want Christian pride in America! I could care less which man and woman decides (or decides not) to marry each other based on race, ethnic group, or Christian tradition. I think this argument for racial and ethnic purity and segregation is missing the mark. The main point of unity and social cohesion in America should be Christianity. Christianity should be our tent in the woods. -Support domestic, foreign, and monetary policies that promotes the interest of Americans first. -Marriage = Man + Woman. Nothing else. -No more special meals at public schools for religious reasons. If you are a parent and you don’t like it, pack your kids lunch. If the different peoples that were flooding into this country were Christian, productive, and learned/primarily spoke English, even if they were not white, there wouldn’t be a great clash of cultures in this country. The problem is primarily religion and power players fanning the flames of race wars for their political, economic, and social gain.